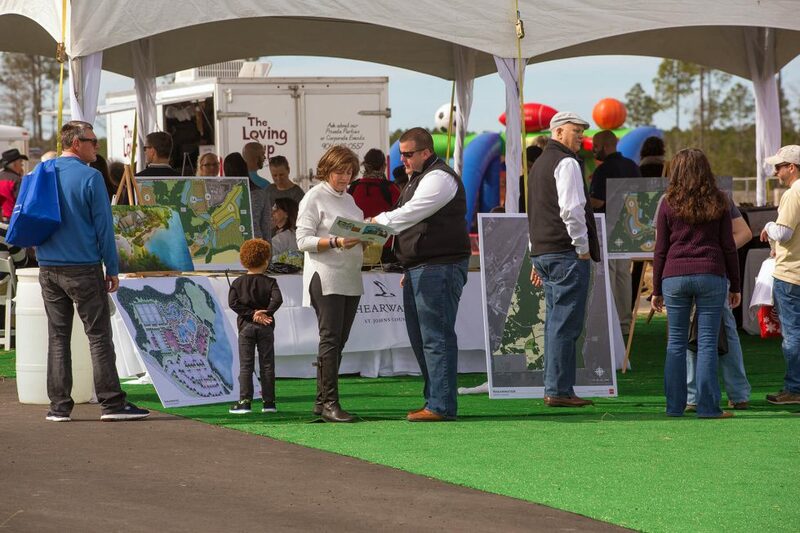 Shearwater, the new master-planned residential community on County Road 210, welcomed more than 1,000 homebuyers to the community’s Grand Opening celebration on Saturday, Jan. 30th. Future residents toured brand-new model homes from each of the four home builders, explored Shearwater’s extensive nature trails, and visualized the future of the community’s multifaceted amenity center as it continues to take shape. During the Grand Opening Celebration, future residents used a special “Shearwater Passport” to guide them through the unique characteristics that will make Shearwater such a desirable place to live. Visitors explored six different model homes and the wide variety of floor plans, architectural details, and home features offered by each builder: David Weekley Homes, Lennar, Richmond American Homes and MasterCraft Builder Group. Outdoor enthusiasts were delighted by North Trout Creek Trail and the picnic area next to a scenic overlook on Trout Creek, which offered a taste of Shearwater’s magnificent natural landscape and immersive, active lifestyle. The impressive amenity center was met with similar approval. When it opens later this year, Shearwater’s amenity center will include a 7,200 sq. ft. Fitness Lodge, four Har-Tru clay tennis courts, resort-style lagoon and lap pools, slide tower, Lazy River, and a variety of playfields. The Kayak Club will form the centerpiece of the amenities, providing 6,800 sq. ft. of recreation space with gathering areas and event venues for residents to enjoy community activities. The 1,500-acre community at Shearwater features over 600 acres of preserved natural habitat punctuated by a collection of parks, ponds, playgrounds and lakes designed for outdoor enthusiasts. A kayak and canoe launch will provide direct access to Trout Creek and the beautiful St. Johns River. Shearwater is situated within the highly-rated St. Johns County School District, directly adjacent to Timberlin Creek Elementary School, and within a few miles of Switzerland Point Middle School and Bartram Trail High School. Shearwater is located at 206 Shearwater Parkway, St. Augustine, FL 32092. To learn more about the community, visit www.shearwaterliving.com. Freehold Communities, headquartered in Boston, MA, is currently developing approximately 10,000 residential lots in Texas, Tennessee, North Carolina and Florida. Freehold creates Vital Communities™ that embrace healthy living, engagement, connectivity, stewardship and distinctive home design. As it evaluates opportunities, the company focuses on the right planning, the right properties, and the right partners. Beginning with comprehensive research to gain insight into the unique needs, trends and preferences in the local market, Freehold carefully considers each property to determine how to best maintain its beauty and character to create a Vital Community, and partners with quality, creative builders who share Freehold’s philosophy of offering niche solutions and unique, timeless designs.